Fashion Polish: Cult Nails™ Warehouse Overstock Clearance Event! 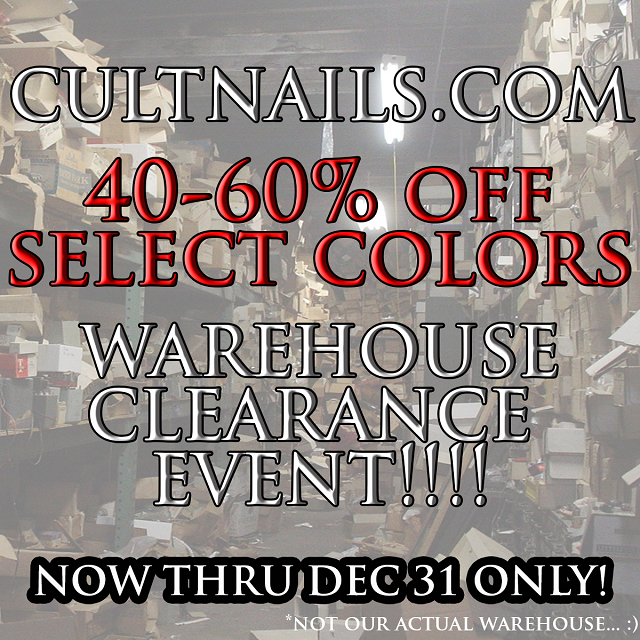 Cult Nails™ Warehouse Overstock Clearance Event! Cult Nails™ has had tremendous support over the past 3 years, and I am thankful and truly humbled by this day after day. When I conceived the line, my dream was to eventually offer several core colors while introducing and evolving approach seasonally. Much like fashion designers create lines specific to seasons and trends, my objective was to bring that idea to this industry. The concept was simple, be a niche brand of polish that brings a little something different while maintaining an appeal to many. In 2014 we will introduce new shades in smaller sized collections with the idea that many of the colors will be limited edition runs that, once sold out, are unlikely to remain as core colors. In preparation for 2014, and the new direction we are heading, we are clearing out the warehouse. We've got several colors ready to be sold between 40 and 60% off! While several of these colors are amazing, and incredibly unique to Cult Nails™, we simply have too many in the warehouse to adequately prepare for what promises to be an exciting year at the Compound! Below is a list of colors that will be available at the discounted rate effective immediately! This event will last until December 31, 2013, or while supplies last. This will be the last chance to get these colors before they are removed from the site permanently, allowing us to prepare for next year! During the event, and beyond, we will be modifying our Free Shipping policy and requirements. Starting now, US customers will receive FREE shipping on all orders over $20.00, orders to Canada and Mexico will ship free at $50, and international orders will require $100 to qualify.